I use Music Learning Theory as the foundation for my students learning. We are also a Leader in Me School and require students to track data and goals in all areas of learning. 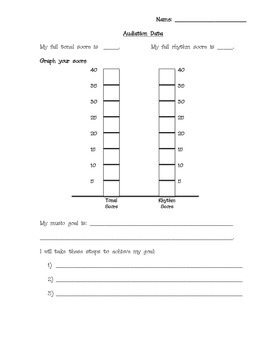 I developed this sheet to track students' developmental scores for music audiation. Students graph their raw scores and set a musical goal (tonal or rhythm) based on the lower of the two scores. We talk about actions steps we can take in class to improve in one of those areas.